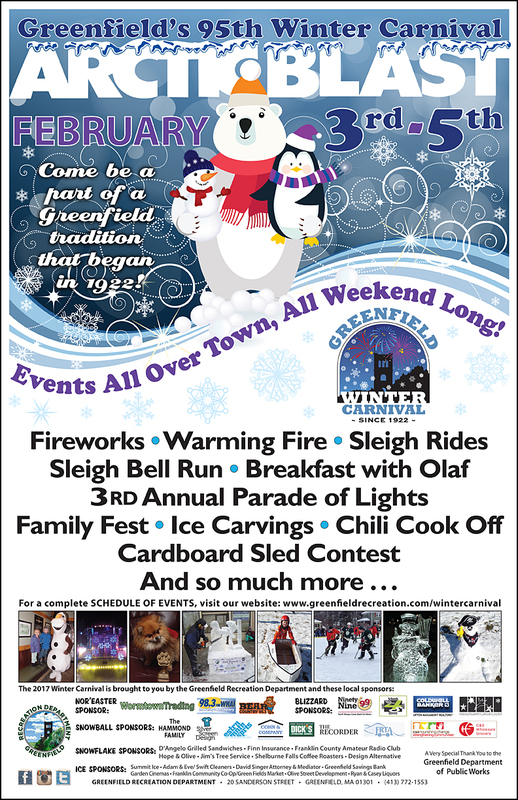 Join the winter fun this weekend at Greenfield's 95th Annual Winter Carnival, starting Friday, February 2nd through Sunday February 4th! Ice sculpting starts on Friday in front of sponsoring businesses. There is a warming fire starting at 5:00 and the Parade of Lights starts at 6:00. There is a full day of events on Saturday and Sunday that include Youth Basketball League Game, sleigh bell run, public ice skating, cribbage tournament and the Youth Center at 20 Sanderson Street has many events scheduled. Bring your pets on Sunday, February 4th and enter them in the K-9 Keg Pull. The realtors from Coldwell Banker Upton-Massamont Realtors will be there to show support for our furry friends. For more information click here to visit the carnival's website.